Plan your days, weeks, and months with the Nimble Task feature. Our Task feature enables you to stay on top of your most significant engagement opportunities by easily creating follow-up reminders that will send notifications directly to your Inbox and on your mobile device. Tasks can also be delegated to another team member if they plan to follow-up and follow through on important memos. Our Tasks feature can be found within any contact, company, or deal record. It can also be found within the Activities Tab, and set up as a widget on your Today Page! Let's take a closer look at the Nimble Tasks feature! The Task feature enables you to quickly log and schedule activities related to a contact. When you create a Task from a contact record, Nimble will automatically autofill certain fields that pertain to the contact. To launch the feature, simply select "Task" which is located under the Quick Action bar. Task Name - Title your task to easily locate it for reference. Task Description - Outline the details of your task to strategize appropriately. Mark As Completed - Capture date and time a task is completed. Due Date - Set a deadline to receive push notifications to your mobile device. Assigned To - Delegate tasks to other team members. Related To - Add contacts that pertain to the task for easier follow-ups. Related Deals - Associate existing deals with your task to get a 360 view of what you need to do to close the deal. Tags - Organize your tasks into groups to stay organized. Once the Task is logged, you will be able to view a list of completed and scheduled Tasks in the Pending & History tab. To view the details of the Task, simply click on the title to launch the pop-up window. You'll then have the ability to set the priority of the Task, collaborate with your team members by leaving comments, alter the Task description, and mark it as complete -- all without leaving the contact record. Tasks can also be created within a Deal record to set follow-up reminders on your most important business opportunities. To create a Task, simply go to the Deal record and select "Add Activity" >> "Tasks." You can now create a task that will be automatically associated with the deal. 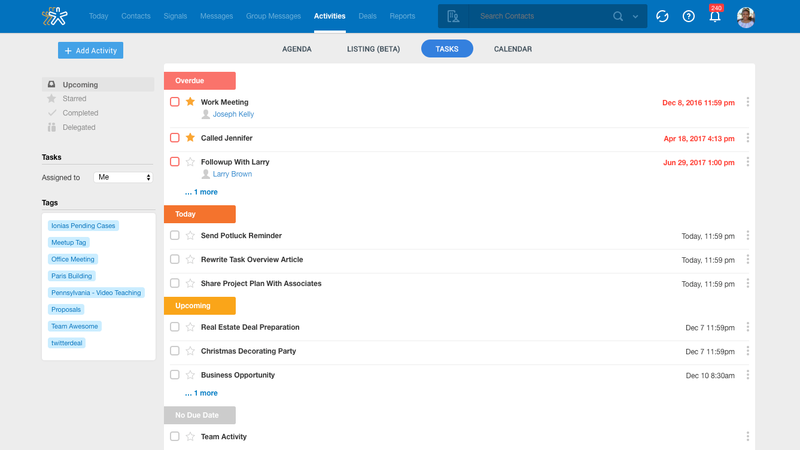 Nimble makes it easy to see all of your overdue, upcoming, and completed tasks in a list view. Just visit the "Activities" tab and select the "Tasks" sub-tab. 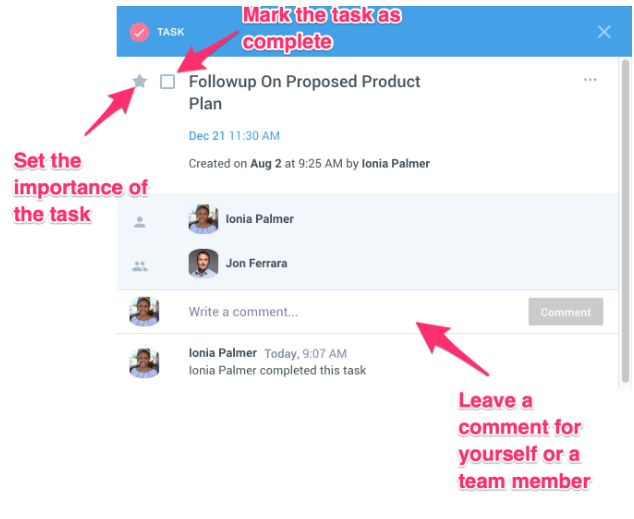 Task are sorted automatically by the actions you take: upcoming, starred, completed, delegated, and tags. You may also log Tasks from the Activities Agenda, Activity List (BETA) or Tasks sub-tab by selecting "Add Activity" >> "Tasks." Tasks can also be created/accessed from the Nimble Smart Contacts App, Office 365, and Gmail widgets; as well as from the Today Page and within an email thread in the Message tab. Notifications for Tasks will appear under the Bell icon. Check out this article for more details: Task Notifications. When using our mobile apps, you can setup notifications in Settings which will alert you of upcoming tasks at a specific time each day. Hover over any tasks to take quick actions such as marking as complete, mark as important, modify, or delete.